Gujranwala is a city renowned for its rich culture and ancient traditional architecture. Visitors can’t help but notice the cultural feel in their surroundings, be it the buildings or the food. 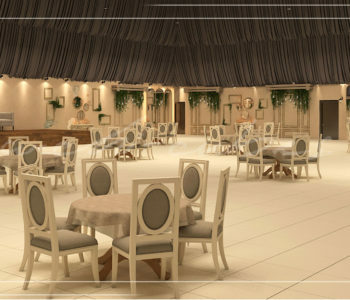 Marriage halls can be a perfect way to capture that feel and rich tradition of Mughal Architecture. 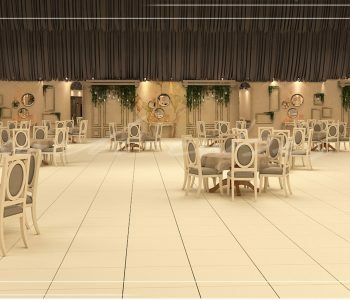 Such thought was the source of enlightenment by our architects in Lahore while designing this marriage hall in Gujranwala. The exterior tells the story of an 18th century dwelling showing the interplay of white limestone and dark wood carved into perfection. Of course the materials used are more modern but the need for cultural nostalgia was met perfectly. The exterior woodwork is the perfect representation of the Islamic Architecture components in detailed craftsmanship i.e. the eight pointed stars, the ‘jaali’ work and also the ‘jharokas’. What better place to get married than the representation of your cultural roots? The interior is both the continuation of the exterior context and somewhat opposed to it. The interplay of curves with lines is obvious. The interior designers worked hard with color play to capture the attention towards the magnificent roof once you enter the hall. 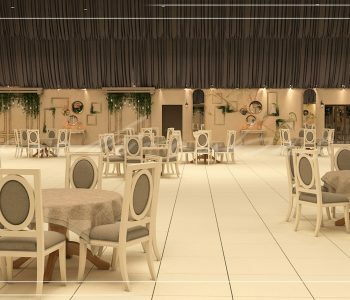 The pearly white floor, the beige walls and the chosen grey and beige for the furniture, each contribute beautifully to the illusion of larger space under the darkened never-ending ceiling. 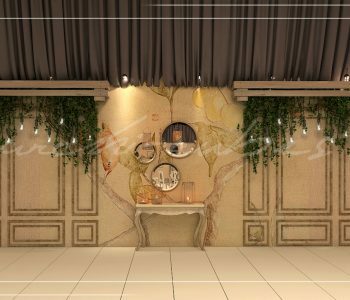 The walls capture the natural aesthetics via beautiful hanging vines complemented with twinkling hanging lights. The whole décor is somewhat antique mixed with contemporary. 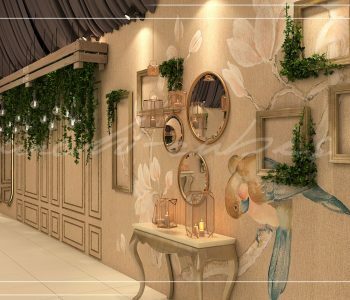 The empty frames with vines, the circular mirrors reflecting the dull lighting and brightening up the space in their own way and lastly, the detailing on walls captures the true essence of scenery with blooming flowers and birds. 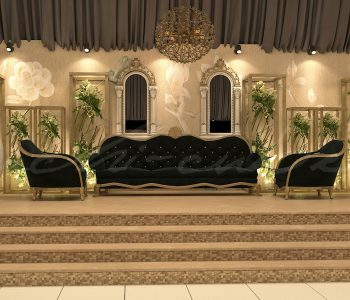 The stage itself captures the royalty feel with minimalism. 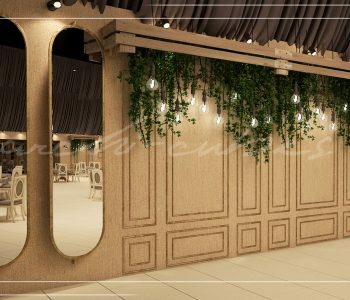 Designed by some of the best interior designers in Lahore, the stage furniture reflects the dark ceiling, easily capturing the attention towards itself. Complemented with a dash of every element in the entire hall, the stage captures the magnificence of the hall in itself quite elegantly. Each space has its own story to tell once you get to experience it. 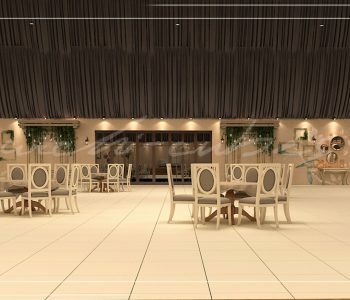 Everything from traditional exterior to the dark ceiling, the interplay of bland colors, capturing the scenery, the lighting elements, the frequent curves and even the greenery lets you experience the unique blend of tradition and contemporary. 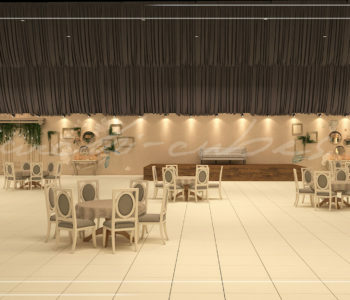 Interior Designers in Lahore are coming up with qualities designs in the realm of marriage hall interiors lately and our Architect Design Firm, Archicubes aims to be rated as the Best interior Designer in Lahore.